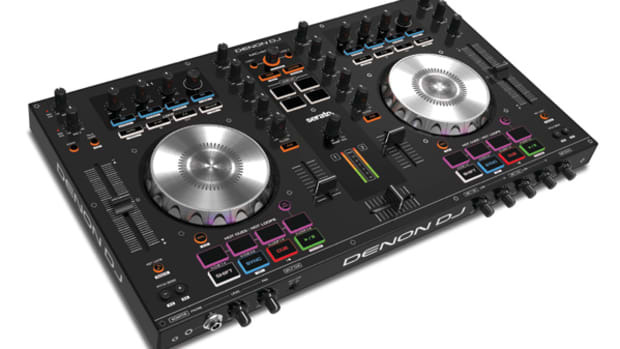 The Denon MC2000 is the new compact DJ controller which is full of MIDI controls for your favorite software, a solid-metal build quality, all in an affordable package that DJ&apos;s are sure to love. Check out our full HD-Video and written review after the jump to see if the unit is good enough to take the cash out of your wallet. 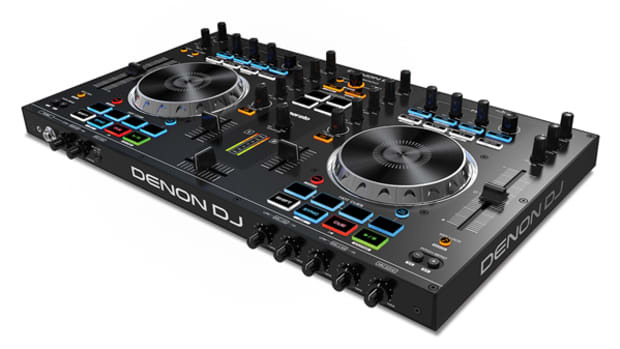 The new Denon DJ MC2000 is a new ultra-compact Digital DJ controller that comes bundled with a two-deck version of Serato DJ Intro and has the same all-metal chassis, faders, and jog wheels from the professional Denon MC6000 which we reviewed last year (found here). The Denon DJ MC2000 has a mostly-metal construction throughout the chassis with some plastic mixed in for the jog wheels, knobs and buttons. All of the knobs have a metal post underneath for durability during transport and storage. I like the overall compact size and feel of the Denon DJ MC2000 which puts it right in the same size-category as the really small controllers such as the recently reviewed DDJ-WeGO and the Reloop BeatMix as they are generally smaller than a 17-inch laptop in terms of length and width and can easily fit into a backpack or bigger-style laptop bag. All of the key use DJ buttons on the MC2000 illuminates very brightly to let the user know what features are active at a glance. The other buttons are black and are mostly used for navigation and on-screen functions within the software. The Denon DJ MC2000 does not come with a power supply as it is fully USB-Powered and must be connected to a computer in order to power the unit. The MC2000 is a fully MIDI-mappable DJ controller that can work with almost any DJ software out on the market today. 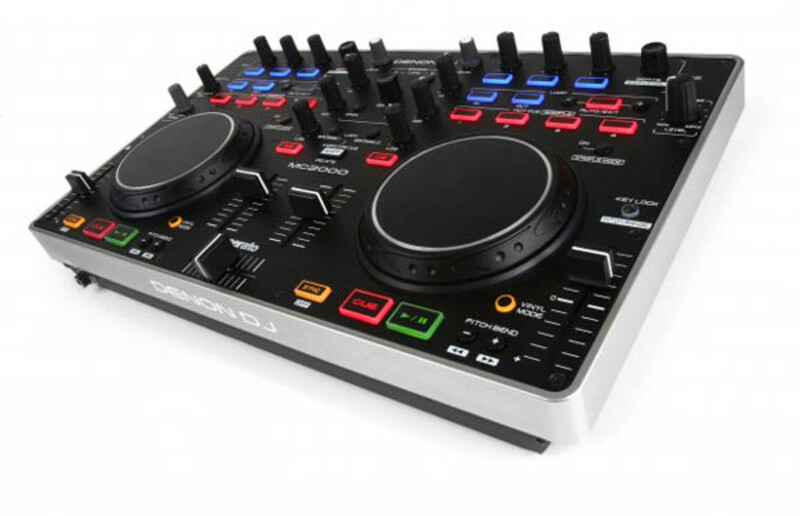 For this review, I am mostly going to test the MC2000 based on the Serato DJ Intro software that comes bundled with the controller. I had a chance to configure my own Traktor Pro 2.6 mapping for the unit just for a quick test and the results were quite good. Denon has recently released a Traktor TSI mapping file on their website but at the time of writing this review I created my own TSI file that worked just fine. 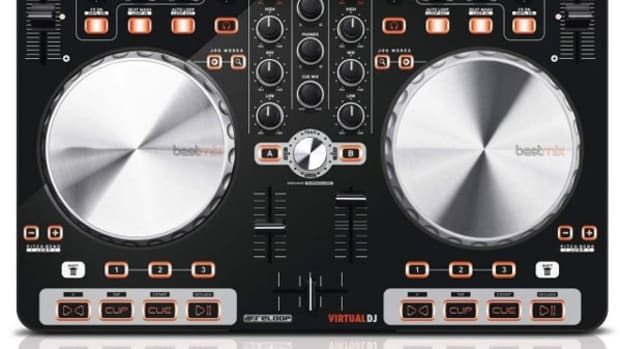 The MC2000 is also compatible with the newly released Virtual DJ LE 7.3 as a straight plug and play controller. 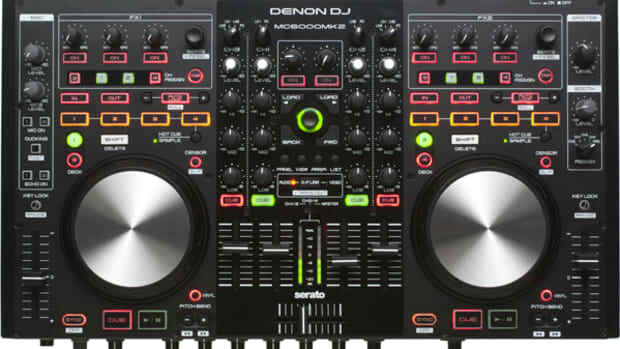 The Denon DJ MC2000 controller matches up well with Serato DJ Intro as mostly all of the buttons and knobs correlate to an actual software function. Most DJ’s will probably be satisfied with the features in Serato DJ Intro that comes with the controller, but keep in mind that it is mostly a bare-bones DJ software that may require an upgrade one day to explore more advanced features. The setup of the Denon DJ MC2000 was really simple with the user only having to use the supplied CD to install the ASIO Driver (on a Windows Machine) and Software for the controller while plugging in the USB connection to the computer. You must also connect your speakers through the supplied RCA Master Output and connect some headphones for monitoring and you’re ready to play your digital audio files through the MC2000 and Serato DJ Intro. All of the inputs and outputs are on the rear of the unit. This brings me to my first minor gripe with the MC2000. There is only one Master RCA output and there are no additional output options. Most beginner DJ’s won’t really need a balanced or booth output, but it’s always nice to have the option for proper monitoring while performing on the road. There is an additional AUX RCA input to playback music from alternate Line-Level devices such as smartphones or MP3 players in case the software clonks out. (Note: since the machine is powered via USB, the computer must always remain ON when playing back audio through the AUX port). The AUX RCA port also has a volume control knob and a miniature knob next to it for monitoring meaning you will be able to pre-listen to the AUX music in the headphones before you “go-live” with the sound. There is only a ¼-inch headphone output on the lower-left front panel of the MC2000. It would have been nice to have an 1/8-inch headphone output jack as well since lots of users will be using the same headphones with many other types of devices which usually only take the mini-type connector. On the rear of the controller there is a ¼-inch Microphone input with a microphone volume control knob. The Denon DJ MC2000 has a really good set of feature that most users need and want for today’s DJ styles. All of the knobs (EQ’s, Headphone & Master Volume) are exactly the same as the ones found on the bigger Denon DJ Controllers and mixers. They have the same professional feel with a rubberized coating that feels good to the touch. They also have a metal post backing to ensure durability. The crossfader and linefaders are also taken from the MC6000 as well. The crossfader is not easily user-replaceable but it was pretty loose and was great for easy-going scratches and cueing. The Cut-in distance is about 2.0-2.5mm which is a bit on the long side for rigorous scratching. There is also a very small delay when it comes to super-fast cutting when using the crossfader with Serato DJ Intro. I was actually able to achieve less latency when I mapped the MC2000 to Traktor Pro on my own. It still was not the perfect one-to-one operation, but very close. The crossfader curve control is built into the Serato DJ Intro software and can be set to Fade, Cut, or Thru depending on your mixing needs. There are no crossfader or linefader reverse functions on the MC2000 or in the Serato DJ Intro software. The Line faders have much more resistance to them and they feel good and work nicely for riding the volume levels. They are definitely good enough for mixing and are a bit longer than the crossfader to get the accurate mixing volume levels. There is no LED Line-level or Master-level Meters anywhere on the controller, so the user will have to check the software at all times to make sure the volume levels match up. Above the linefaders are the full-kill 3 Band EQ knobs and Gain knob at the top of the unit. In the middle of the unit there are browse buttons and an infinity click-style encoder to select tracks and folder. There is a Load A and Load B button which will load the track that is highlighted and a Back and Forward button that allow for easy navigation through playlists, crates, or files with ease. The Cue controls for headphone monitoring are found on the top of the Denon DJ MC2000. There is a Volume knob and a Cue/Master Mix knob. Each deck has a cue button that illuminates to let you know when that deck is playing through the monitors. The Master Volume knob is located to the top right of the unit. The Jog wheels on the Denon DJ MC2000 are taken directly from the Professional-Grade MC6000 controller and they feel just as good as they did when we reviewed that unit months ago. The jog wheels feel sturdy and they don’t shake or wobble and they have a nice touch-sensitive top with a good texture for grip. They are solid on top with a harder plastic feel to the sides for nudging and slowing down the music for beatmatching. There is a vinyl button that changes the mode of the jog wheel to either scratching or mixing modes. The jog wheel performance for scratching is decent with Serato DJ Intro. You won’t be able to catch every single jog wheel detailed movement when pulling off complex scratches, but the MC2000 will do just fine for basic cuts, juggling, and scratching. When I mapped the controller to Traktor Pro 2.6, I noticed that I could actually get the fader and jog wheels to be tighter mapped for better overall results. Below the jog wheels are the illuminated buttons for Cue, Play/Pause, and Sync. These, and all other illuminated buttons are hard plastic. This is one of the main differences between the bigger MC units and the MC2000. The buttons on the MC6000/MC3000 are rubberized with a back-light giving them a slightly better and tactile feel. These are the same style buttons used for HotCues, Samples, Loops, and effects. Below the jog wheel is also the pitch bend buttons that double as Track fast-forward and rewind buttons when shift is pressed. In the lower outside corners of the MC2000 lies the tempo sliders. The tempo sliders have a good amount of resistance to them with a center-click to know when you are at absolute zero. Above the jog wheels are the controls for HotCues, Samples, Loops, and effects. There are four HotCue buttons on each deck that also double as the four Sample Banks within the Serato DJ Intro software. The user switches between HotCue and Sample mode by pressing the small black button to the right of those controls. The samples can be looped or one-shot when pressed depending on the software setting. Above the HotCue and Sample buttons are the Loop controls. There is a true Loop In and Loop Out manual control buttons along with an Auto Loop button with loop grow/shrint buttons to make changes. Above the Loops are the FX1 controls (above the left deck) and FX2 controls (above the right deck). There are three buttons and three knobs which are used to activate the effect assigned to that button and to change the wet/dry value of the said effect. There is an encorder knob to the right of these three effect knobs which are used to change the timing or Beat of the effect. In this version of Serato DJ Intro, the user is allowed to combine up to three effects per deck and they work and sound really nicely overall. 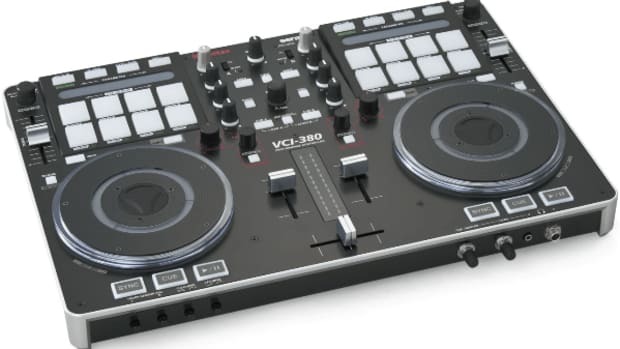 Usually, I don’t speak much about sound quality of DJ controllers because they have all been pretty good and the standards have been pretty high for the past year or so. Having said this, I will usually comment on sound quality when a controller is exceptionally better or worse than the norm I am used to. I’m very happy to report that the 24-bit sound card on the MC2000 delivered superb sound both from the headphone output and from the RCA outputs on the rear of the unit. Even though the MC2000 is only USB-powered, the sound was really rich and full throughout our time with the unit. The volume level of the headphones was abnormally high and still produced low distortion at high volumes. The sound quality is great! 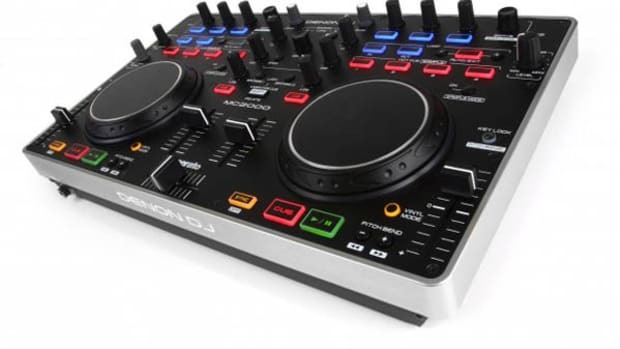 In Conclusion, Denon DJ MC2000 is a high-quality metal-chassis Digital DJ controller which is an excellent option beginner-to-intermediate level DJ’s or for DJ’s on-the-go who still wants a seriously professional compact setup that can easily be transported from place to place. The Denon DJ MC2000 comes bundled with a two-deck version of Serato DJ Intro with tight integration and good controls on-board for almost all software functions. The MC2000 has great jog wheels and faders that are taken directly from the professional MC6000 so you know you are getting quality materials throughout. The MC2000 also has full-featured on-board controls for Transport, Hot Cues, Samples, Effects, Manual Loops, and even Autoloops. On the downside, the Denon DJ MC2000 does not have any LED meters on the face of the unit to let the DJ see the volume levels at a glance, and there are no additional Booth or Balanced outputs. Overall though these are both minor gripes as most users will only need just an RCA output and most of the line level properties are handled by the software automatically when the track is loaded into the deck from the computer. At the end of the day, the Denon DJ MC2000 is probably my favorite compact/beginner style DJ controller as it’s really built to last and you can easily tell that the MC2000 is basically a stripped down version of Denon’s top-tier controllers without skimping on the quality and parts that DJ’s want. 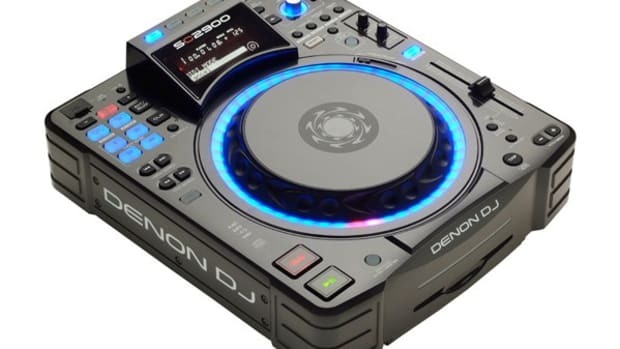 DJbooth.net is going to recommend the Denon DJ MC2000 Digital DJ controller to any new or intermediate-level DJ as well as any other seasoned DJ who wants to get a compact controller to work with their primary setup or to travel with them to DJ on-the-go.